Lacinipolia stricta is a common small light orange-brown to dark brown moth (FW length 10 - 13 mm) with a white-rimmed hourglass-shaped reniform that flies in a variety of Pacific Northwest habitats during late summer and fall. The ground color is slightly to strongly mottled warm orange-brown, varying to dark orange-brown. The median area is darker orange-brown in most populations, occasionally much darker dark brown in some western populations. The terminal area is also darker, usually gray-brown to dark blackish brown. The posterior subterminal area is lightest, usually lighter yellow than the rest of the wing. A short black basal dash is uncommonly present. Some of the veins on the distal wing are dark in some specimens. The lines are dark orange-brown, double with lighter filling. The basal line is indistinct. The antemedial line is slightly angled toward the outer margin and often slightly excurved. 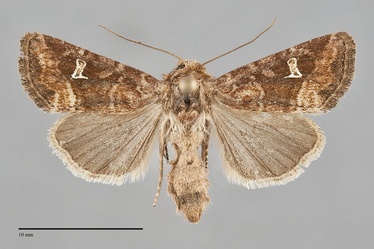 The median line is usually absent in light specimens and dark brown in dark ones, nearly transverse to the wing. The postmedial line is very close to the lateral reniform spot and nearly straight below the spot, strongly angled toward the base. The pale filling of the posterior line is often fused to the pale area in the adjacent subterminal area. The subterminal line is pale luteous but most evident as the transition between the orange subterminal and gray terminal areas, slightly irregular, drawn slightly toward the base opposite the cell and in the fold. The terminal line is thin. The fringe is similar to the terminal area. The spots are outlined in thin orange-brown to black. The orbicular spot is a slightly tilted oval filled with the ground color or a slightly lighter shade, usually inconspicuous. The reniform spot is upright bow-tie shaped, occasionally with a spike-like extension toward the base from the posteromedial corner, lined by pure white with central filling of the ground color. The claviform spot is variable, absent, orange-brown, or thin and black. 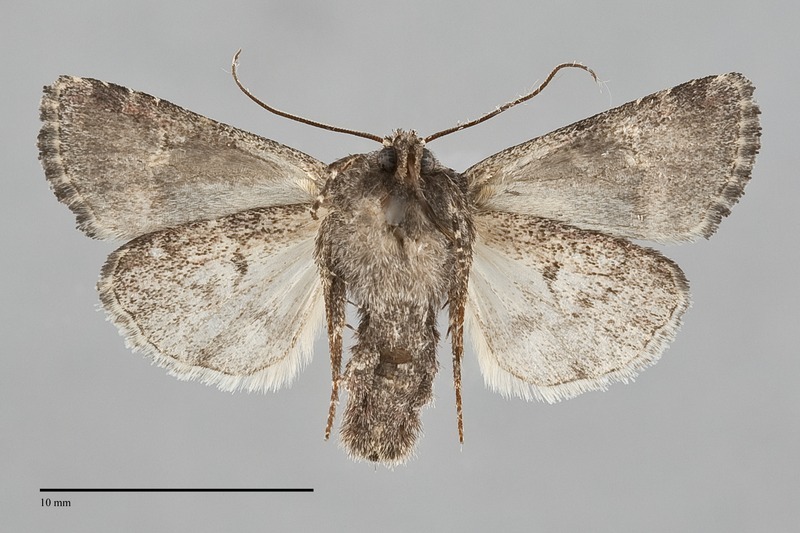 The hindwing is light gray-tan in pale specimens to dark gray in dark ones, with barely perceptible darker veins and a lighter fringe. The head and thorax are even orange-brown, gray-brown, or dark brown. The surface of the eye is covered by fine hairs. The male antenna is beaded. This species can be recognized by the combination of orange-brown to dark brown forewing with the crisply defined white-lined reniform spot. 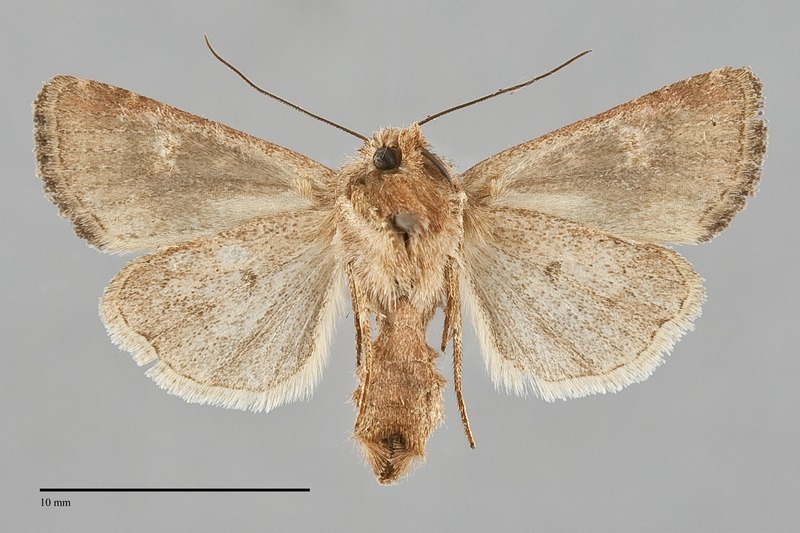 The only similar species is Amphipoea lunata, a moth that is restricted to southern Oregon in the Northwest. It has a white reniform spot on an orange forewing. Its reniform spot is bar-like without a dark center like that of L. stricta. It is a member of the tribe Apameini and lacks hairs on the eye surface. Lacinipolia stricta is geographically variable in our region. Most populations are light orange-brown, but those from western Oregon are dark brown. 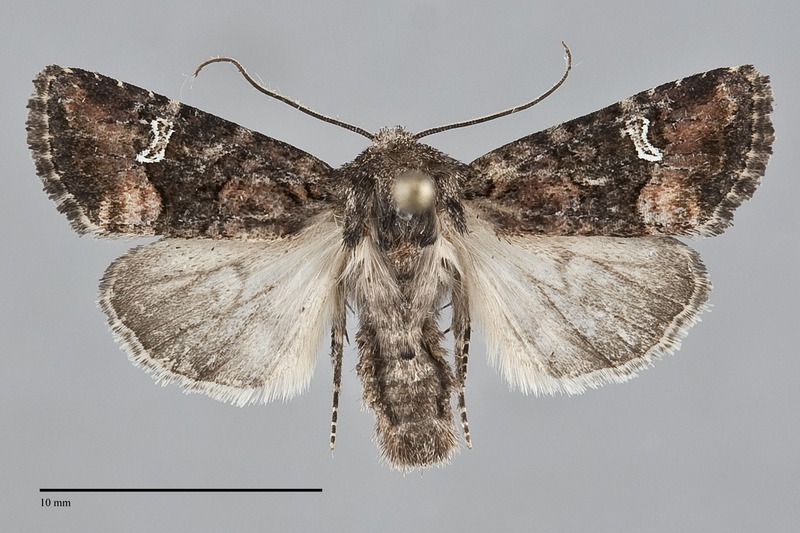 These have been called Lacinipolia circumcincta (Smith) previously. Clines from light orange to dark specimens occur from north to south and east to west and we see no evidence that there is more than a single species in our region. Specimens from very dry steppe habitats in southeastern Oregon are paler and slightly grayer than those from elsewhere. This species and one of its synonyms were named from specimens collected in our area. Hadena? stricta Walker was described from [British Columbia], Vancouver Island. The type locality of the synonym Mamestra ferrea Grote is also Vancouver Island. This species is common in a variety of Pacific Northwest low to middle-elevation habitats, including open grasslands, oak woodlands, disturbed agricultural habitats, urban areas, coastal rainforests, mixed hardwood forests, and mixed hardwood-conifer forests west of the Cascades. East of the Cascades, it is particularly abundant in mixed hardwood-conifer forests, open ponderosa pine forests, wet meadows in riparian zones, and in disturbed agricultural or urban habitats. It also flies in open sage steppe. Lacinipolia stricta is widespread in the Northwest, occurring on both sides of the Cascade and Coast Ranges, as far north as south-central British Columbia. The distribution of this species is predominantly along the West Coast where it is found throughout California to the border with Mexico. It is also found in the northern Great Plains from Alberta to Wyoming. The larva of L. stricta is a climbing cutworm that feeds on many kinds of herbaceous vegetation, and is a minor pest in agricultural crops. Lacinipolia stricta flies in late summer and fall, first appearing in early August and flying until October. It is nocturnal and comes readily to lights. This species is a minor pest in agricultural crops such as lettuce, strawberry, and peppermint.